This 64-year-old female fell approximately three weeks ago, and presents with right ankle pain. 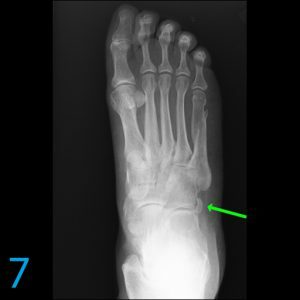 Prior to this incident, this patient’s foot was assessed in 2015 and 2017. Images 1 and 2 are radiographs of the patient’s foot from 2015. 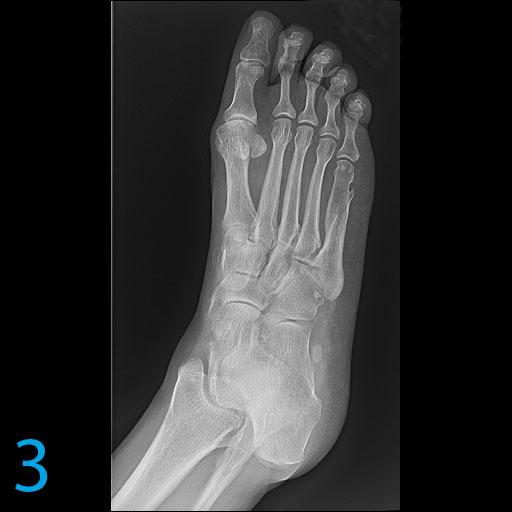 Images 3 and 4 are radiographs of the patient’s foot from 2017. Images 5 and 6 are MRIs of the patients foot from the current visit (2018). 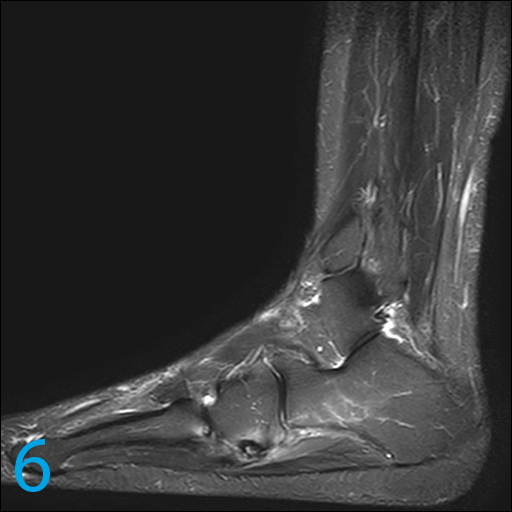 Q1 – From images 1 through 6, what do you think the most likely diagnosis would be? A1 – The most likely diagnosis is a full-thickness tear of the peroneus longus tendon. The diagnosis can be made using plain film radiographs. The os peroneum, noted on the 2015 and 2017 exams (images 7 through 10, green arrows), is fractured and distracted on the 2017 study (images 9 and 10, blue arrows). Followup MRI in 2018 confirms a complete full-thickness tear (image 11, blue arrow). 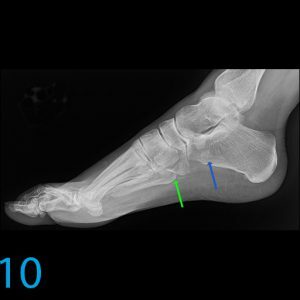 The fracture of the os peroneum is most clearly identified on sagittal images (image 12, green arrow). 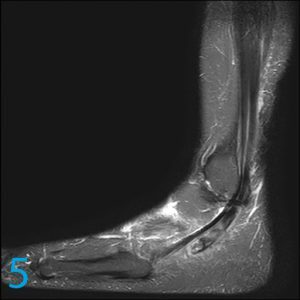 With distal peroneus longus ruptures, displacement and proximal migration of an intact os peroneum can be seen. Pearl: Very small tears of the peroneus longus tendon may be seen as the tendon passes around the os peroneum and prove highly symptomatic. Peterson, J.J. and Bancroft, L.W. Os Peroneal Fracture with Associated Peroneus Longus Tendinopathy. American Journal of Roentgenology. 2001;177: 257-258.